Greenville, South Carolina’s Swamp Rabbit Trail shadows the Reedy River along 22 miles of a former rail line. It includes a section named for American Tour de France hero George Hincapie, who resides nearby and leads bike rides for dedicated cycling tourists. It is partially lined by seemingly impenetrable kudzu vine undergrowth that is synonymous with the South. All of these seem like natural components of upstate South Carolina, but in truth, they are demonstrations of the power of transplantation. Kudzu is Japanese, Hincapie’s a New Yorker, and the Swamp Rabbit Trail sprung from the commerce delivered by the arrival of BMW in 1994, when the Bavarian carmaker opened its first assembly plant outside Germany in nearby Greer, S.C.
That factory has grown nearly as quickly as the roadside kudzu, and it has embedded BMW into the local community just as completely. The factory has expanded to six million square feet, and it now produces an average of 1,400 X3s, X4s, X5s, and X6s a day. It employs 10,000 workers, and it accounts for 30,000 jobs when parts suppliers are considered. Thus, BMW has insinuated itself as thoroughly as kudzu and Hincapie into a region sometimes considered insular and skeptical of anything non-native. So, when BMW says it intends to participate as a native in the SUV market despite its roots as the constructor of “The Ultimate Driving Machine,” believe it. 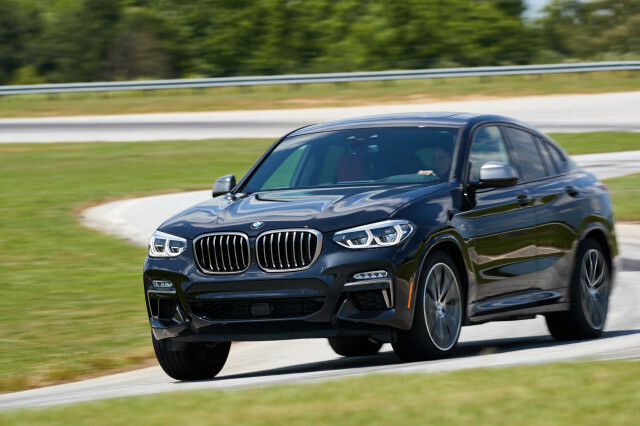 On the launch drive for the 2019 X4, BMW indulged journalists with laps around the company’s wet skidpad at its Greenville-Spartanburg Performance Center. White that was fun for us, it also served to illustrate the point that the X4 routes more power to the rear wheels than to the fronts, which makes it possible to drift the SUV around the sprinkler-soaked asphalt circle. Out on the surrounding circuitous mountain roads, the differences in ride, handling, shift programming, and throttle response among the various settings in the X4’s Driving Experience Control system became obvious. BMW makes Sport Plus, Sport, Comfort, and Eco Pro settings available, and Sport provided an excellent combination of response and sportiness during vigorous street driving. Eco Pro makes the X4 annoyingly sluggish in regular driving, but it could be tolerable for someone seeking maximum efficiency in highway driving or very gentle driving circumstances. The X4 is equipped with the latest version of BMW’s variable-ratio steering. The system provides useful feedback through the wheel, and the linearity of its response to input is improved, but the Jaguar I-Pace’s non-variable-ratio steering demonstrates what is possible when engineers focus on the fundamentals. The twin-turbo 3.0-liter inline 6-cylinder in my X4 M40i test vehicle had the lovely voice these engines are known for and it was enhanced by the M Sport exhaust. Unfortunately, BMW also enhances it electronically through X4’s speakers, which makes enjoying the sound feel fraudulent. Driving with the windows down so the true sounds from the tailpipes overcome the fake sound from the speakers helped solve this issue. Still, it is unneeded gimmick in a vehicle that sounds great without assistance.